Vise 3 Ball Clear Top Roller/Tote includes a See-thru "clear top" VISE design. It is a tote and a roller into one. It includes heavy duty fabric, zippers, and reinforced stitching. 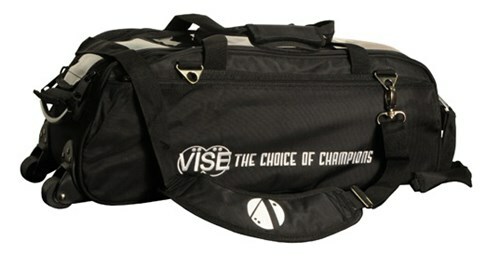 This is the bowling bag for you if you want to show off those bowling balls! Hello Chuck! This bag weighs about 7 pounds. We followed up with VISE and the dimensions are approximately 28x10x10(LxWxH) and there is just enough room for 3 bowling balls to fit inside. Due to the time it takes to produce the Vise 3 Ball Clear Top Roller/Tote Black ball it will ship in immediately. We cannot ship this ball outside the United States.